Golden Boy brand fish sauce has a nice overall flavor and very attractive light golden color. 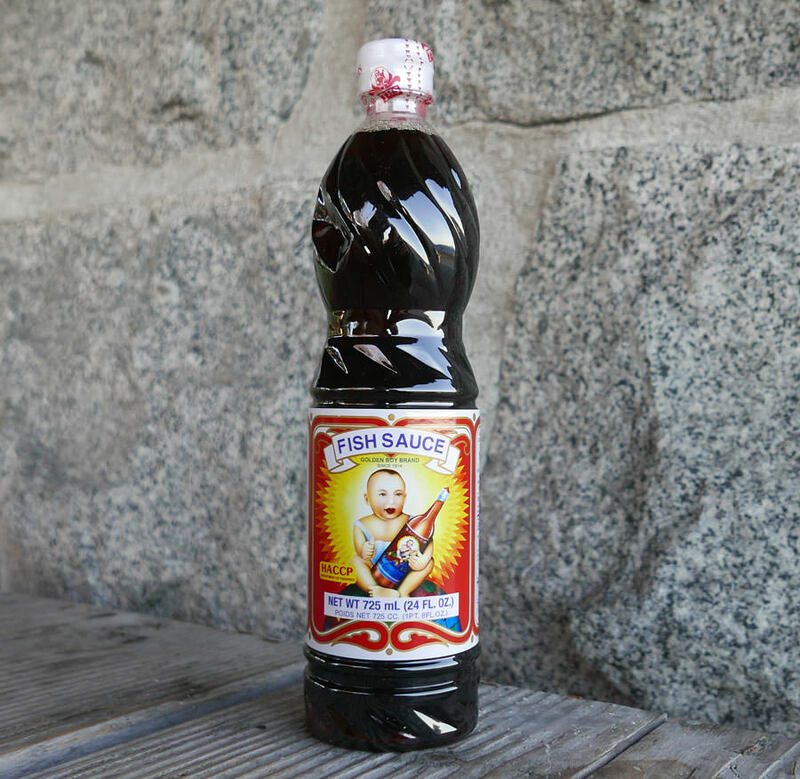 The quality is very good, it's made in a traditional process and is considered a "gourmet" fish sauce. Golden Boy fish sauce is not strong-smelling and it's slightly sweet, a little bitter. Whether or not the average consumer would notice a difference between Golden Boy and Tiparos is somewhat unlikely but aficionados will appreciate the subtle differences (most notably the muted aroma). Author Jon Fasman wrote about fish sauce in The Economist magazine's Intelligent Life section, referring to ImportFood.com: "I’m partial to the Tiparos brand, which is tea-coloured and rather strong, and Golden Boy, which is lighter and milder (and has a chubby, happy baby on the label)." We suggest that Tra Chang brand is a bit more tasty, but many customers know what flavor they like, and they choose Golden Boy. It's a great choice. Please see our photo tour and explanation of exactly how fish sauce is made. Packed in a 24 oz plastic bottle. Ingredients: anchovy fish, salt, sugar. Product of Thailand. Here we demonstrate two versions, Version 1 is our favorite and one you can make in your kitchen without a charcoal grill. The chicken in both versions is prepared as you'd find in Thailand -- using thin strips, instead of thick cuts that restaurants outside of Thailand often serve for satay.